In a modern hip resurfacing implant, the acetabular component is uncemented and the femoral component is cemented. This is known as "hybrid" fixation, and is the method used in most hip resurfacing today. The concept of uncemented fixation of a hip resurfacing femoral implant is an attractive one, because in general, bonding the bone to an implant is thought to result in greater longevity of the artificial joint. It is thought that by having the bone directly attach to an implant, there is a biologic interface that can respond to stresses and will not deteriorate over time. In traditional total hip replacement, for example, most surgeons now perform uncemented (cementless) fixation of both the femoral stem and the acetabular component. 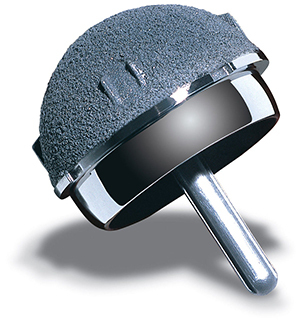 However, in total knee replacement, uncemented implants have historically had some issues reliably achieving this fixation, so the majority of total knee replacements are performed with the use of cement. Cement to attach an implant to bone has been used for over 50 years in orthopedic surgery. It is theorized to be the "weak link" in an artificial joint replacement because it could degrade over time and perhaps be affected by a patient's activity level. On the other hand, it offers an immediate bond to bone without the need to wait some time to achieve a solid attachment. Cement has different properties when subjected to different kinds of stress; it is very strong in compression, but weak in tension. Thus, in a total knee replacement, where the components are mostly in compression, biomechanical engineers have wondered whether uncemented components would have any benefit over cemented fixation. A traditional total hip replacement is more subject to tension along the lateral side of the femoral stem, so uncemented fixation does make sense for a traditional total hip implant. Since a hip resurfacing femoral implant is a sphere, the forces upon the femoral head are almost entirely in compression. Therefore, it can be argued that cemented femoral head and uncemented femoral head fixation should be equivalent. In my experience, I have mostly used cemented femoral head fixation, and have had numerous patients return to a high level of activity, including impact sports and running. I am not aware of a patient's activity leading to loosening of their femoral implant, to date. Nonetheless, I believe that cementless femoral head fixation is a good option and I have been using it selectively for over 10 years with the Biomet Recap. Although I am not sure it will demonstrate superiority to cemented fixation, I am intrigued by the possibility. So, if uncemented femoral fixation is something you are interested in, please let me know before your surgery.